All 68 regular season Flint Firebirds games can be heard live on the FM radio dial throughout Mid-Michigan on US 103.1 FM WQUS. Additionally, Townsquare Media’s sister station, 101.5 FM WWBN will carry the Firebirds Coach’s Show every other week on Tuesday nights from 6-7 p.m. at Timothy’s Pub in Flint. The multi-year deal with Townsquare Media will bring Firebirds’ hockey live to the FM radio dial for all regular season home and away games, including the three games from the Buffalo Pre-Season Showcase and OHL playoff games, on 103.1 FM WQUS (coverage map). The broadcast agreement includes extended pre-game and post-game shows before and after every game, giving fans the most coverage of Flint Firebirds Hockey all season long. Flint Firebirds Hockey fans can also listen to 103.1 FM WQUS live anywhere in the world at www.us103.com or by downloading the US 103 App here. US 103.1 FM is also available on Amazon Alexa-enabled devices. In his 11th season behind the microphone in hockey and fourth with the Flint Firebirds, play-by-play announcer Dominic Hennig will call the game action all season long for Firebirds’ fans on the radio on 103.1 FM WQUS, online on the “OHL Live” video stream and on television province-wide throughout Ontario on the OHL Action Pak. Hennig will also co-host the bi-weekly coach’s show on Banana 101.5 FM on Tuesday night’s from 6-7 p.m. with Townsquare Media radio personality, Maggie Meadows. Recognized as a leader in television coverage, the OHL is the only hockey league outside the NHL that has its own live television subscription package. OHL fans in Ontario have the opportunity to add the “OHL Action Pak” to their television subscription to watch almost every OHL game on TV, home and away, throughout the season, similar to the NHL Center Ice and MLB Extra Innings TV packages. 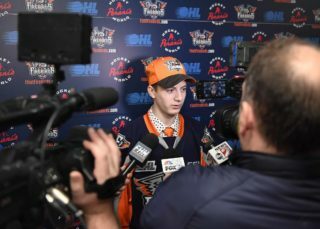 During the 2017-18 season, 65 of the 68 Flint Firebirds games had live television coverage. See the live television listings table below. In the United States, the NHL Network simulcasts OHL games that are televised live nationally throughout Canada on Sportsnet. 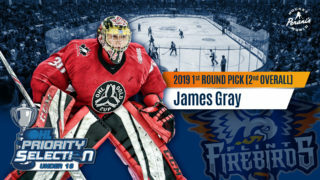 Select Flint Firebirds games are televised on a tape-delayed basis throughout Michigan and northern parts of Indiana and Ohio on channel 900 for Comcast Cable subscribers. All Flint Firebirds home and away games throughout the 2018-19 season can be watched anywhere in the world online on ‘OHL Live‘ and on the ‘OHL Live’ App. 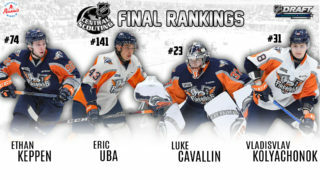 ‘OHL Live’ is a league video streaming platform that delivers high quality live and on-demand coverage of all regular season and playoff games annually. The cost is $6.99 per game, $69.99 for Flint Firebirds away games only, $179.99 for all 68 home and away Firebirds games and $279.99 for all 1,360 OHL games throughout the 2017-18 season. The OHL is not only a leader in television coverage but also online streaming quality. All Flint Firebirds games are streamed live using the home team’s HD television feed, which means fans can watch all Firebirds’ games in high quality with multiple camera angles, instant replays, score & time graphics, etc. as if they were watching an NHL game on television. Nov. 9 vs. Soo Rogers 468/Cogeco 468 .